This Is My Story is rightly a celebrated deep soul classic. Everything about this New York track is first class – from his husky vocals to the beautiful string arrangement via the superb guitarist (Eric Gale? Cornell Dupree?). And the song is simply terrific too. I wonder if we will ever hear whether the two songs from Crockett’s session that have never seen the light of day are anything like as good as this. A ten star track and no mistake. 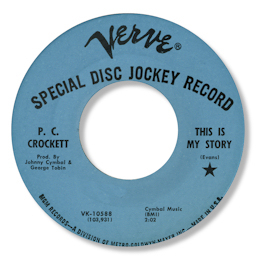 Note ~ The two unissued Crockett tracks are called “Rescue Me” and “I’m Not Proud”.